Syndactyly of the fingers is one of the characteristics of Poland Syndrome, more commonly referred to as “webbed fingers”. Charles Goldfarb, MD is an orthopedic hand surgeon at Washington University in St. Louis specializing in congenital hand and upper extremity disorders. Doctor Goldfarb has a blog which he writes to regularly. He wants to help to demystify abnormalities of the hand and wrist that children may experience from the time of birth. Below is an excerpt from his blog we thought you might find useful. 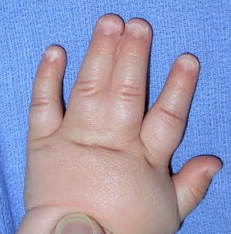 Syndactyly is the abnormal connection of 2 fingers. Most commonly, it is a webbing between 2 fingers- the middle and ring fingers. However, it can involve any two fingers or can involve the thumb and pointer finger. It can also involve more than 2 fingers. The webbing can involve the entire 2 fingers or just involve part of the fingers. It can be just skin or can involve the bone also. Most types of syndactyly happen during the development of the hand and arm. The entire arm forms between 4 and 8 weeks of gestation; this means that by about 56 days after the baby is conceived, the hand is in its final shape and form (although a lot smaller!). During the final developmental phases nearing 40 days and after, the fingers are all webbed. Normally, the skin interconnections disappear before 56 days but, if the cell signaling doesn’t happen like it should, the skin connections (the webbing) stays and that is what we call “syndactyly” In most cases, there is nothing a mother or father did to cause this abnormality and there was nothing that he or she could have done to prevent it. Syndactyly: Fingers that are joined together, with skin and possibly bony connections. Partial vs. Complete Syndactyly: Syndactyly can involve the complete fingers (all the way to the tip) or just part of the fingers (partial). Cutaneous vs. Complex Syndactyly: Cutaneous (or “simple”) syndactyly implies a skin connection only whereas a complex syndactyly includes bony interconnections between the fingers. Complicated Syndactyly: Syndactyly associated with a syndrome (usually a situation with other health issues). Typically, children with syndactyly function well although the more fingers that are affected, the more difficult function may be. The primary functional problem in syndactyly is grabbing large objects or grabbing circular objects (because the fingers don’t spread apart as well as they normally would). The hand looks different with syndactyly. This may bother the child and may change how others relate to the child. In some kids, this may lead to stress and decreased self-esteem. PIP-UK recognises credit of the content of this post belongs to Charles Goldfarb, MD.